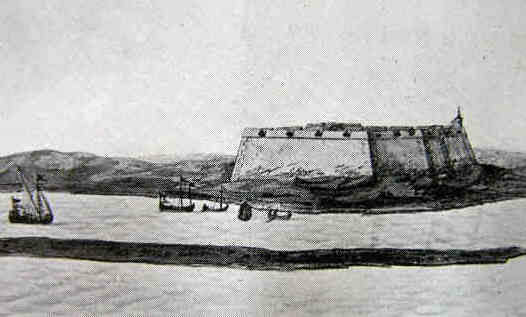 A Portuguese fort in Mauritania. In 1444 the Portuguese landed on the island which they found uninhabited. The Dutch had followed up the Portuguese on the West Coast of Africa nearly concurrently with the English; that is to say, at the close of the sixteenth century, when both these Northern maritime nations could give themselves the excuse of the Spanish absorption of Portugal for wresting from the Portuguese such of their possessions in Africa, Asia, and America as could be torn from them. About 1600 the Dutch captured from the French Arguin Island near Cape Blanco, and the little Island of Ber near Dakar (Cape Verde), which they called Goree, after an islet off the coast of Holland1. Of course, the main objective in West Africa at that period was the Gold Coast, the demand for slaves not having as yet become so important as to oust gold from its first place as a bait in African commerce. They therefore visited the coast of Liberia on their journeys to and from the Gold Coast, though occasionally a special voyage was made to the “Grain” Coast for pepper and ivory. “Grain” was apparently as much a Dutch as an English word (from the Latin granum), and was first applied by the Dutch in succession to the Portuguese name Malagueta. 1 These places were taken from Holland by the French in 1677-8. Portugal was usually stripped of her colonies or forts in this order: first by the Dutch; then by the French plundered the Dutch in the seventeenth century, and the British snatched or bought from France and Holland in the eighteenth and nineteenth centuries.